Featuring established speakers, fun activities, and incredible events, the USA Science and Engineering Festival (USASEF) is known as the largest STEM event in the world for a reason. Taking place from April 7-8, the event looks to entertain and inspire hundreds of thousands of attendees. However, the show would most likely not be possible without Lockheed Martin. The founding and presenting host of this year’s Festival, Lockheed Martin looks to do much more than just have their name associated with the event. We spoke with Dr. Charles Johnson-Bey, Director of Engineering & Technology at Lockheed Martin’s Cyber Center of Excellence, to discuss the company’s plan for the Festival, the importance of STEM education, and what attendees will gain at the event. Innovation & Tech Today: What are your expectations for the USA Science & Engineering Festival this year? Dr. Charles Johnson-Bey: We’re excited about joining thousands of students as they experience the festival and explore their passions. Our hope is that these young attendees will become inspired to further their educations – and pursue a career path – in science, technology, engineering and math (STEM). I&T Today: What presence will Lockheed Martin have at the event? CJB: We will have an interactive exhibit showcasing the latest technology from our labs, which we’ve coined the “Rad Labs” experience. The innovations being showcased may look like what you see on TV and in the movies. However, everything that attendees will engage with will all be real. In our labs, Lockheed Martin is making the impossible possible – and we can’t wait to share that experience with USA Science & Engineering Festival-goers. We’ll also have a “Future Career Predictor” that will allow students to find which STEM careers suit their interests. As Lockheed Martin’s Director of the Cyber Center of Excellence, I am looking forward to seeing all of the budding cyber experts stop by! Generally speaking, our hope is that, by offering a sneak peek at the type of work we do at Lockheed Martin, we can inspire the next generation of innovators to pursue their STEM dreams. I&T Today: Tell me a bit about the Generation Beyond Mars Experience Bus. actually traveling on the surface of the red planet thanks to some incredible video game technology. Riders will get to see a Mars rover at work, experience a Martian dust storm, and even see a Martian basecamp. My favorite part about this experience is that it helps students recognize that missions to Mars aren’t as far away as they might think. I&T Today: How do you believe Lockheed Martin’s involvement will continue the growth of STEM education at the event? CJB: Lockheed Martin is proud to play a role at USA Science & Engineering Festival because we know engaging students at an early age gets them interested in STEM. Events like this one help show these kids that the sky is no longer the limit when they pursue a career in these fields. There are so many professional jobs that require science and math education – not just space exploration – and we’re glad to provide students opportunities to explore. I&T Today: Along those lines, how will Lockheed Martin’s approach encourage STEM education after the event? CJB: The USA Science & Engineering Festival is just one of the ways in which we’re working to inspire the next generation of STEM professionals. We support a broad array of programs that strengthen the pipeline of STEM talent by regularly engaging K-12 students through our programs such as Engineers in the Classroom, First Robotics Challenge, and partnerships with Girls Inc., Great Minds in Stem, and National 4-H Council. For example, our TIE3 team – which stands for Teamwork, Innovation, Enthusiasm, Experience, and Exposure – comprises cybersecurity professionals who visit local schools, primarily in the Baltimore region, and work with kids to show them how their academics ultimately tie to careers. 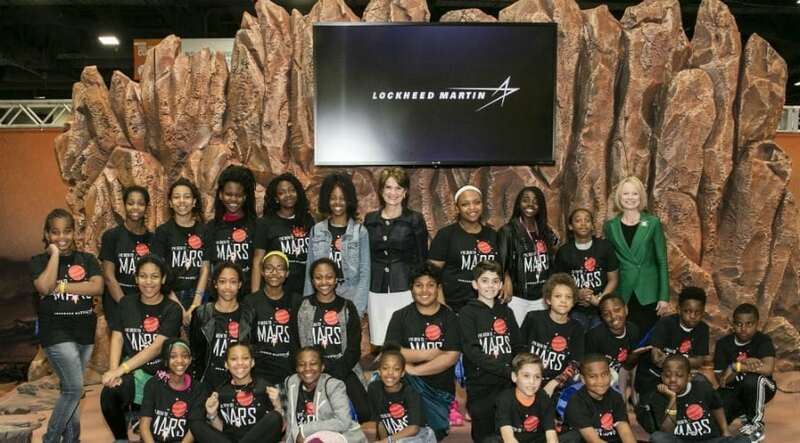 As a company, Lockheed Martin employees personally volunteer their time to mentor and engage students on STEM, having logged more than 12.5 million volunteer hours over the past decade. We also reach out to underrepresented populations through sponsorships of multicultural events like BEYA and HENAAC. I&T Today: What do you believe people will most take away from the event? and teachers and provide them the resources needed to continue engagement on topics like space exploration and keep this positive momentum going. I&T Today: What do you believe will be the biggest change for Lockheed Martin between this USASEF event and next year’s? CJB: Each event, Lockheed Martin tries to go bigger and better than the previous one. It will be pretty difficult to top this year’s experience, but we’re already thinking of ways to get kids excited about solving real-world problems using cybersecurity, robotics, and advanced energy technologies. Our next experience will likely include some of these exciting fields. Next article InnoTech Opinion: Can We Trust Technology Anymore?